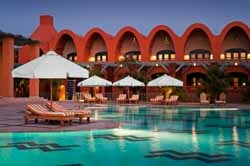 Arabic for "the lagoon", El Gouna is a sophisticated beachfront resort town built on a series of islands and lagoons connected by canals. 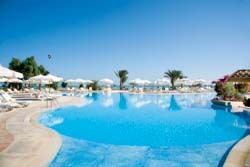 It lies 30km north of Hurghada, around a 45 minute taxi or coach ride. 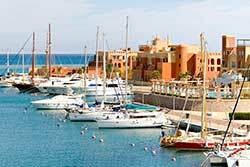 A favourite weekend escape for high class Egyptians and wealthy Europeans, with its stylish Kafr El Gouna / Abu Tig Marina area of boutique shopping, restaurants, bars and nightclubs, it’s particularly attractive to couples and families with younger children. Specialising in water sports, including scuba diving, water-skiing, kite surfing, parasailing and snorkelling, it’s also famous for its golf course, which was co-designed by Fred Couples. Other attractions around town include a small aquarium, go-kart track, paintball arena, tennis courts, horse stables and a football stadium. There is a range of diving packages available locally, from trial dives for the complete novce, to PADI-certified courses for beginners and advanced divers alike. Already certified to dive? 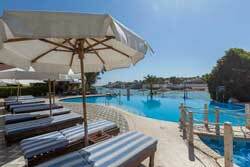 Daily dive packages and equipment rental are also available. El Gouna Golf Club's par 72 course was designed by a world-renowned PGA golfer, and combines carefully placed bunkers, lagoon features and desert rough to test your skills. Professional coaching and club, trolley and golf cart rental available. Explore the desert landscape up close on a quad bike safari. Grab your helmet and let your guide show you the ropes, then it's time to go off road on a thrilling 45km advenrutre through the arid mountains and winding sand dunes of the eastern desert.